What issues from across the company can I see on the dashboard? In your Shift log in Bizimply there is a heading called Issues. 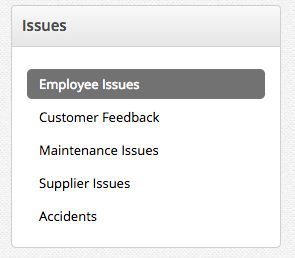 This is where you will be able to fill in your Employee Issues, Customer Feedback, maintenance Issues, Supplier Issues and Accidents. An employee issue can be logged from an employee profile. Supplier and Maintenance issues can be logged from the Service App.